We list below all landlords' fees applicable for our Fully Managed Services. Figures quoted are inclusive of VAT and further details can be found in our Management & Service Agreement (available upon request). County Estate Agents are members of the Property Ombudsman and the National Approved Lettings Scheme (NALS). 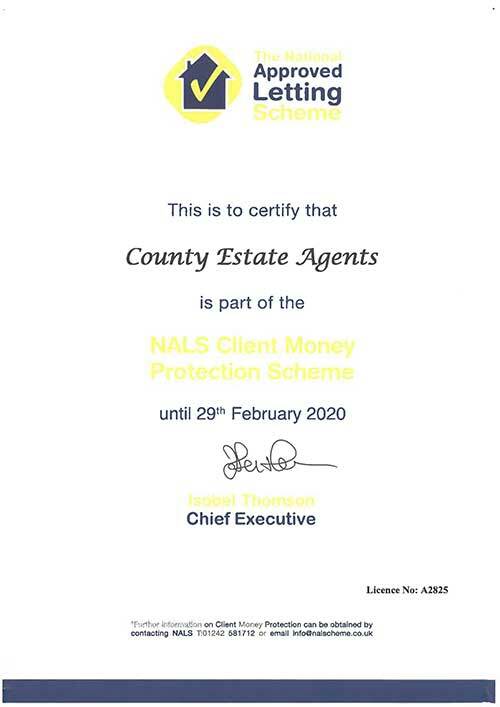 We have full client money protection under our membership of the National Approved Letting Scheme and our Membership Number is A2825. The above fee structure is subject to negotiation depending on the value of the property or number of properties to be managed. Additional expenses maybe required for third party services to include such items as gas safety inspections; legionella risk assessment; electrical safety inspections and Energy Performance Certificates. County Estate Agents may charge its contractors and inventory agents an administration fee. Also, third parties may be employed for reference and inventory purposes.